Mind Garbage: Countdown to Comic Con - 1 Week to Go! Holy crap, I can't believe it's only a week now until London Film and Comic Con. There have been more announcements, but once again sadly the only one I'm interested in is a Sunday only, so to any of you that get to meet Matt Smith, know that I am incredibly jealous. So, I'm sure you must be wondering whether I'm once again going to tell you how little I've done on my cosplay, which based on the past couple of posts would be a pretty fair assumption. But you would wrong, I've finally made some progress with it. 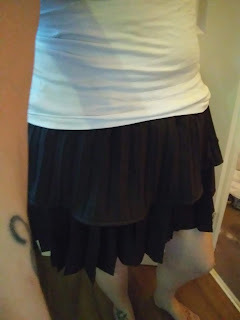 My skirt is finally finished, although I ended up not using my friends sewing machine. I did it by hand, which is all well and good, but I stabbed myself under my fingernail by accident and it really bloody hurt. Seriously, I was worried about bloodstains on the skirt the amount of times I stabbed myself. Or course sewing with a can of cider may not have been my best move. I didn't use the fabric pens in the end, they would have taken forever and I probably wouldn't managed to get even coverage. 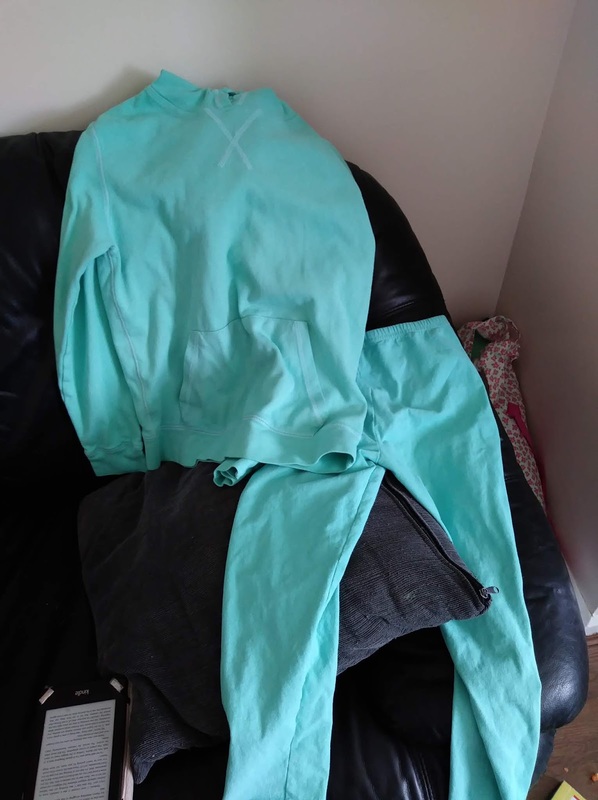 I found some washing machine dye in aqua green, which has turned out to be the perfect colour. Rather than trying to colour match fabric paint to colour in white tights, I also got some white leggings and dyed them alongside the hoodie. So rather than painting white leggings with coloured stripes, I painted coloured leggings with white stripes, which was much easier colour-wise. But you'll have to wait to see those since the paint is still wet. 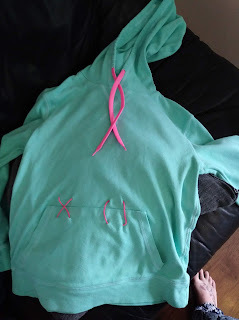 I used some pink string for the stitches on the hoodie, and tied 2 pink shoelaces together to make the cord for the neck of the hoodie. The string was slightly lighter than the shoelaces though so I used a pink sharpie to colour it in so that they look better. 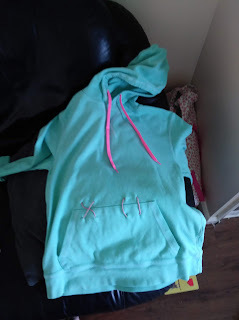 So my hoodie is done and the leggings are almost finished, my skirt is finished, I've done my hair bits just got to get them sorted for putting in my hair. Which means that now the main things to sort out are the hair and make up. Vanellope has side fringe bits down at the front, so I need to either get myself a fringe, or find a way to pin my hair in such a way that it looks kind of like one. Hopefully in the next few days the schedule for the comic con will be released, at which point we can start to plan the day, looking when our group has photoshoots. Plus we can see when the free talks are, which are always a good source of entertainment, not to mention great if you need a sit down. With one week to go you don't have much more time to enter the contest to win the Kaylee bear, so take the chance to enter now. You've got to be in it to win it. Yay almost done with the cosplay! I love how much creativity goes into cosplay outfits. Can't wait to see the finished look! Oo I hadn't heard about washing machine dye before. Something to look out for! Ive never heard of a comic con before, I literally had no idea this was even a thing! How interesting that must be for those who love comic characters! I just love the dedication and the creativity of cosplayers! Hope you’ll have a fab time! Have fun! Never been to comic con despite being a massive geek lol. Also salt water gets out blood if you need to!